In The Works is presented monthly and feature three composers or composer teams, each presenting about 20 minutes of new material. 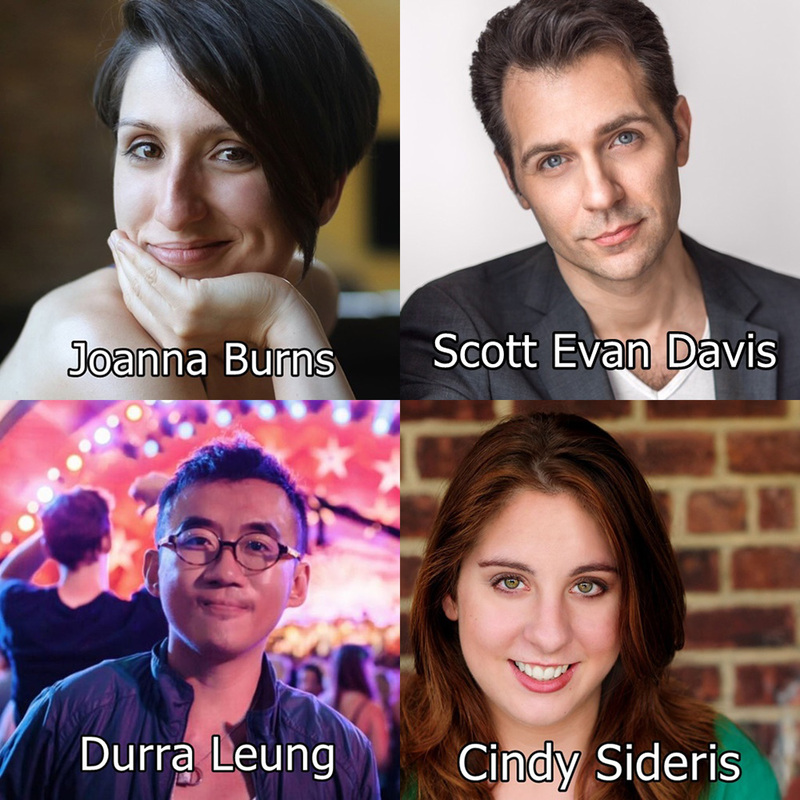 This month, Sunday 17th at 9:30pm features the works of composers: Joanna Burns & Cindy Sideris, Scott Evan Davis Durra Leung. Hosted by: Thomas Honeck. SCOTT EVAN DAVIS is a multi-award-winning Composer and Lyricist based in NYC. After working as an actor around the U.S., he began composing in 2010. Davis has since gained international recognition in the worlds of musical theatre and cabaret. Scott has performed concerts of his music at Birdland Jazz Club in NYC, The Kennedy Center in Washington, D.C., as well as London, Dublin, Australia, and all around the U.S. His songs have been performed at Feinstein’s 54 Below, The Metropolitan Room, Don’t Tell Mama’s, The Duplex, as well as internationally in high schools and colleges. Scott’s debut album, Cautiously Optimistic, features Broadway talents such as Liz Callaway, Faith Prince, Daniel Reichard, Nikki Renee Daniels as well as others from the worlds of Broadway and cabaret. In the Huffington Post review of Cautiously Optimistic, David Finkle listed Scott among five “must see and must know” emerging writers. His second album NEXT, released in 2016, features performers such as Karen Mason, Robert Cuccioli, Joshua Colley, Derek Klena and Lisa Howard. CINDY SIDERIS has been working as a writer and creative producer for the past 7 years. She began her training with the Upright Citizens Brigade Theatre during the Spring of 2011, completing their Improv and Advanced Sketch Comedy Writing programs. She continued writing with her team, Surfcat, co-producing the sketch show Channel Surfing at The Producer’s Club. Her sketch comedy musical West Side Story Remade had a sold-out run at The PIT. Other Credits: Run This Town (Book/Lyrics, TNNY’s SoundBites Festival @ Signature Theatre). Cindy holds an MBA from NYU with a focus on Entertainment, and is a proud member of The Dramatists Guild and The BMI Lehman Engel Musical Theatre Workshop. Tickets available at: www.purplepass.com/works0617 Don’t miss out.